Visiting Berau District is worth tons of experiences and joys. Not only it has the famous Derawan Islands, but it also offers other tourism objects. 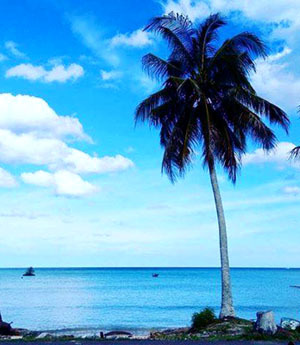 Beaches are not the exception and one of them is located in Biduk-Biduk Sub-district. The name of the beach is Giring-Giring, which is famous for its flawless white sand and dense coastal mangroves. In terms of popularity, Giring-Giring Beach is a renowned place to enjoy the sunset and to relax. The locals often come to the site to enjoy beach walking, as well. Not to mention it is located near to other attractions such as Sulaiman Bay, Serai River, and much more. Once tourists get to the beach, what they can feel is breezy wind. They might see a flawless beauty of nature, too, indeed. Featuring soft-textured white sand, the shoreline is suitable for beach walking. In the back, bushes and trees grow majestically! There are not many of them, them. In terms of size, the beach has a long shoreline and no coral reefs at all. This explains why people are mesmerized by its purity. When it comes to the sea water, it is pristine and calm. No dangerous waves are seen, so visitors can enjoy swimming in a safe manner. Despite its desolated nuance, the beach is well-known among the locals. It even has the potential to attract foreigners. People usually come to this tourist spot for beach walking. Thanks to its comfortable and stunning sand. They don’t even need to wear any sandals or footwear to walk on the sand. The only thing that matters is the temperature, which is quite hot at noon. No wonder, the number of trees is low there. In this case, the best times to visit Giring-Giring Beach are in the morning and afternoon! The next fun activity is definitely swimming or snorkeling. As mentioned before, the sea has calm waves with superb visibility. That means tourists can explore underwater beauty comfortably there. Plus, they have the chance to learn snorkeling! Some spots are easy, while the others are a bit challenging. Thus, it provides an opportunity to take new challenges there. As for the tip, visitors must have prepared the gear beforehand. It is also better to go snorkeling in a group, as it is safer and more interesting. Carrying an underwater camera is allowed, too. Once enjoying snorkeling and beach walking, visitors can simply enjoy the nuance of sunset at dusk. This can be done while eating snacks and drinking a fresh coconut. Such romantic atmosphere would hypnotize everyone as if the beach won’t let people go home! On top of that, it is only the beginning of their adventure because more tourist spots are waiting for them, which are located within Biduk-Biduk Sub-district. First, travelers need to take an airplane to Kalimarau Airport, which is located in Tanjung Redeb (the capital of Berau District). From there, they can continue their journey by local transportation service. This time, the destination is Biduk-Biduk Sub-district. With the distance of 250 km, the trip may take about 6-8 hours. As the name suggest, the beach is located in Giring-Giring Village.